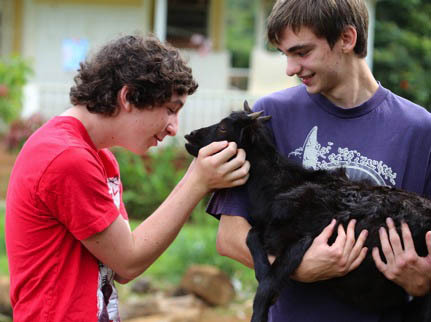 Leilani Farm Sanctuary hosts humane education programs, school field trips, elder activities, animal-assisted therapy for special-needs visitors and at-risk youth, as well as farm tours for the general public. Our programs provide the community with a hands-on experience that is thought-provoking and stimulates social and emotional growth. Most of the animals at Leilani Farm Sanctuary were orphaned, neglected, or abused. Through interaction with these animals, children from troubled homes learn forgiveness, courage, strength, leadership skills, trust, empathy, and kindness. The animals become role models, helping children learn to forgive, overcome their pasts, and reach toward a hopeful future. When we relay the animals' stories to children with violent upbringings, it helps them relate to their own pain in a healthier way. (Often, when children are abused they then abuse others.) By learning empathy and respect for all life, children can break the cycle of violence and become protectors rather than abusers. Animals, with their unconditional love, can often reach youngsters more deeply and effectively than humans can. The Sanctuary's Humane Education and Therapeutic programs are administered by Programs Director, Melody Hofmann, with the assistance of psychiatrist Barry Sultanoff, M.D. Melody was recipient of the Arizona Golden Rule Citizen Award and worked as Program Director for Whispering Hope Animal Ranch in Arizona, designing programs for an 80-acre summer camp for disabled and at-risk youth. The facility partnered rescued animals with disabled youngsters. Melody received additional training in ADA law, cultural awareness, and the Boys and Girls Town model for positive behavioral outcomes, as well as non-violent communication. Earning dual undergrad degrees in Marketing and Psychology from U.C. Berkeley, she has continued on as a life-long learner and has many certifications related to her fields of endeavor. Through her work in the fields of law enforcement, legal advocacy, domestic abuse, child welfare and social work, she has made significant contributions to her community and touched many lives. 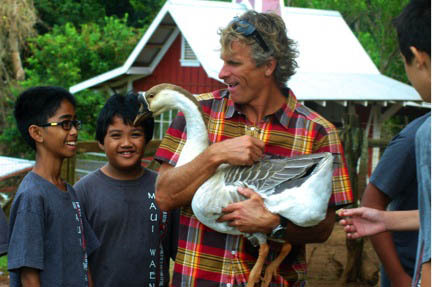 Your $400 donation will sponsor a group of special-needs children’s visit to Leilani Farm Sanctuary. A donation of $4,000 funds their participation in our ten-month animal-assisted therapy and humane education program. Please help these children, who otherwise could not afford to come.